The leaderships of the BJP and RSS discussed the core agenda of Hindutva — the Ram temple, Article 370 and common civil code — for an entire session on the second day of their brainstorming meeting on Monday, indicating strongly that Hindutva was set to come into increasingly sharper focus as the elections approached. As the meeting was over, the RSS announced that there was “no dilemma” in the Parivar over the projection of Narendra Modi as the BJP’s candidate for Prime Minister. This session was held between 11.45 am and 1 pm on Monday and was attended by VHP leader Pravin Togadia as well. Sources at the session said that the “aggressive minority politics” that is burning the country today was also discussed. 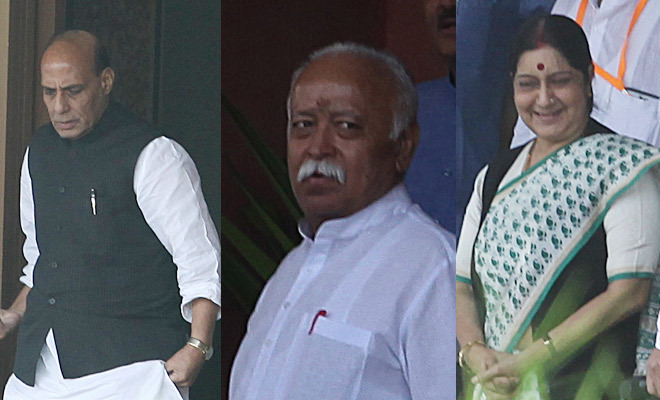 Several BJP leaders confirmed that the Sangh was “back in the mood” to strongly push Hindutva. “The Sangh appears to be in the mood to bring these issues to the forefront,” said an influential BJP functionary. “We are moving back to our Hindutva agenda,” said another leader.